Sculpture by the Sea—a sphere of movement | Where to next? Poor John and I made a very timely stop in Sydney this weekend on our way to India. Sculpture by the Sea is on until 10 November, with scores of exhibits displayed on the coastal walk that stretches between Tamarama to Bondi beaches. It is the largest free outdoor sculpture exhibition in the world. We walked down to Bronte Beach early this morning to start our tour before the hordes appeared. I’ll do another general post on this event, but I simply had to devote an entire post to the most amazing sculpture of the lot. 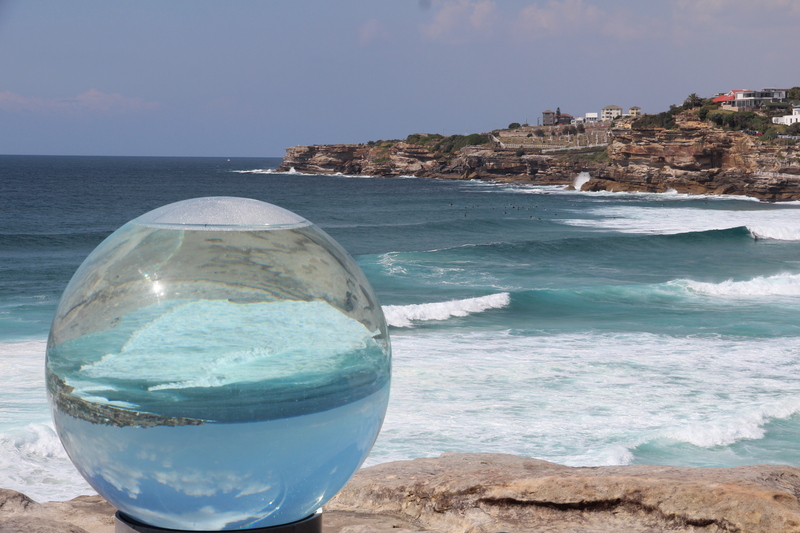 Created by a Lucy Humphrey, Horizon is a huge, mirrored sphere perched high on the rocky ledges overlooking Tamarama Beach. It’s probably about five feet in diameter, and it’s rounded surface captures the movements of the sea below and the sky above. It’s absolutely breathtaking and we stood for a long time, savouring the ever-changing views. Ms Humphrey is one of three winners of a Helen Lempriere Scholarship. These annual scholarships are open to all Australian sculptors who enter a work in Sculpture by the Sea. Each winner receives $30,000, which can be used to advance their career through study or research. And now I’ll let the pictures do the talking. No wonder Lucy was a scholarship winner! Thanks Wanda. Stay tuned for more pics of other sculptures, but this was the true stand-out in my mind. Love sculpture, love sunsets, love Sydney? You’ve got 24 hours! | Where to next?